For the first time since November, First Friday on Fourth Street has returned from its hiatus with some pre-Easter joy. 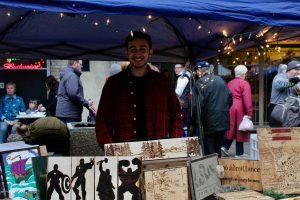 On Friday, April 5, Fourth Street bustled with people buying artisan goods and food, listening to the live music and merrily conversing throughout the evening. This First Friday featured booths lining the streets and full of different crafts, such as paintings, jewelry, soaps, decorations and hats. There were food booths and food trucks selling popcorn, pastries, breads, spice mixes, clam chowder and fried fish. Face painting booths sported lines of children and adults alike. In the spirit of Easter, one table had supplies for people to decorate wooden eggs for display in shop windows. An Easter egg hunt and a chalk drawing area sent children running up and down the block with glee. There were also free horse and carriage rides down the hill at Fort Steuben. 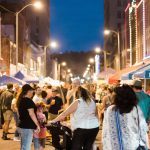 These Friday street fairs occur on the first Friday of every month from April to November for the purpose of bringing the Steubenville community together to be revitalized and strengthened. The next First Friday on Fourth will be held on May 3.